Ivan Cepeda is a Colombian senator, victim representative and one of the country’s most influential moral authorities on the left. His almost personal opposition to former President Alvaro Uribe has made him one of the country’s most polemic political figures. After serving as a representative in the House of Representatives between 2010-2014, Cepeda was elected senator for the Democratic Pole party in July 2014. He continues to work for the Movement of Victims of State Crimes (MOVICE) which he founded. Cepeda was awarded the ACLU’s prestigious Roger N. Baldwin Medal of Liberty in Washington in 2007 for his achievements in the human rights field. Cepeda’s political vision and ideological outlook are influenced by the turbulent history of his family. 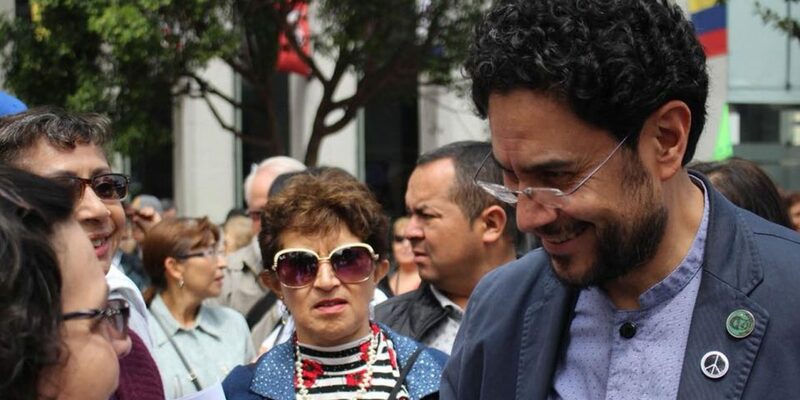 Cepeda, born in 1962, is the son of Manuel Cepeda Vargas, a congressman of the Patriotic Union who was assassinated in 1994, and Yira Castro, leader of the movements for the rights to housing in the slums of Colombia’s capital Bogota. The two prominent leftists met in the Communist Youth (JUCO) and worked together for the Marxist magazine “Voz.” Both were vociferous supporters of the Cuban revolution and opponents of liberal dictator Gustavo Rojas who ruled Colombia from 1953 to 1957. When Ivan was three years-old, his family was forced into exile for openly criticizing the government. They emigrated to Czechoslovakia in 1965. Three years later, following the Prague Spring and the military invasion by the Soviet Union, the Cepedas moved again, this time to Havana, before returning to Colombia in 1970. Back in Colombia, the young Cepeda quickly followed into his parents’ footsteps and became involved in politics. He was 13 when he joined the JUCO. When 19, after his mother passed away with brain tumor, Cepeda moved to Sofia, Bulgaria, to study philosophy. Upon his return to Colombia in 1987, the recent philosophy graduate had been disillusioned with the Soviet version of socialism. “I understood that although the socialist system supplied social equity and citizen welfare, it was not viable because of its authoritarian attitude, expressed through censorship of dissent and violation of individual liberties.” recalled Cepeda in an interview with El Espectador. In Colombia, peace talks between then-President Belisario Betancur, the FARC and other leftist thought leaders gave birth to the Patriotic Union party. From its very onset the political movement was a target for systematic extermination campaigns orchestrated by state agents and paramilitary groups. “My father lived with a gun under his pillow. Every other day, there was a funeral of a colleague,” Cepeda said. The political war continued to take the lives of his acquaintances on the left, until it struck closest to home. On August 9, 1994, while on his way to Congress to support the ratification of the Geneva Protocols, Cepeda’s father was killed in front of him. Cepeda’s first big project was to found the National Movement for Victims, comprised of 17 organizations that intended to uncover and clarify crimes committed by state agents in the 1980s and 1990s. As a result of his justice-seeking initiatives, Cepeda became the object of mounting threats, which forced him to go into exile to France in 2000. He returned to Colombia in 2003 to resume his work in support of the victims of violence of paramilitaries and members of the State. In the same year, along with other human rights leaders, Cepeda contributed to the creation of the Movement of Victims of State Crimes, bringing together victims of state crimes. The underlying aim was to uncover, expose and eradicate the criminal practices of the Colombian state. Thanks to a string of public protests and his activity in MOVICE, Cepeda gained considerable media attention, and an increase in clashes with the administration of former President Alvaro Uribe. As a representative, Ivan Cepeda promoted numerous debates on matters such as political control over the process of land seizures, the prison system, sexual violence against women in the armed conflict, the demobilization process and neo-paramilitary structures in Colombia. In 2010, the American Court of Human Rights found the Colombian State guilty of, inter alia, participation in the assassination of Manuel Cepeda. The Court required the State to publicly admit its guilt, prepare an official publication on the murdered Senator, and provide financial compensation to the relatives of the victim. A year later, 17 years after the assassination, the officials publicly recognized the involvement of the State in the death of Manuel Cepeda. German Vargas, the then-interior minister, acknowledged on behalf of the state that the murder “was committed by state agents in collusion with paramilitaries. The Colombian justice system was unable to find and prosecute those responsible for this crime”. He also apologized to the family of Cepeda. Ivan accepted the plea. In the 2014 elections, Cepeda received a total of 84,126 votes and was elected senator. Since then, he has become one of the main voices of Colombia’s congressional opposition to the left and one of Uribe’s biggest headaches, who Cepeda consistently has accused of having had ties to both the Medellin Cartel and paramilitary organization AUC.